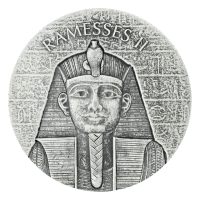 2 أوقية 2017 سلسلة آثار المصرية | عملات فضية للفرعون رمسيس الثاني Order your 2 oz 2017 Egyptian Relic Series Pharaoh Ramesses II silver coin from our online store today to enjoy the lowest price around! The gloriously artful Egyptian Relic series was introduced by the Scottsdale Mint, for the People’s Republic of Chad, in 2016 and this coin, along with a simultaneous release boasting the same subject but a different obverse design, is the 5th addition to the dazzling ensemble. The coin’s obverse bears a portrait of Egyptian Pharaoh, Ramesses II, appearing as we know him in full regalia, head-dress with a cobra jewel above his brow, plaited goatee and staple Egyptian eye makeup. The design is made to appear age-worn and reminiscent of a trinket found in an archaeological dig; vague hieroglyphs share the obverse field with chisel marks and intentional flaws, as well as the Pharaoh’s name overhead. The reverse features the Chad coat of arms; the heraldic goat and lion flank the nation’s shield above a banner which reads, ‘Unite, Travail, Progres.’ The coin’s reverse bears the same marks of ‘age’ that set the series apart, as well as the Republic of Chad legend, the coins weight, purity, denominational value and year of release. The Egyptian Relic series may well be one of the most beautiful ranges released by the Scottsdale Mint, simplistic in design but unlike any other series on the market, these ‘ancient’ treasures are a must have. Fortify your holdings and pay tribute to the kings of old by purchasing your 2 oz 2017 Egyptian Relic Series Pharaoh Ramesses II Silver Coin today.